Sewing can take so much time. Ripping out takes longer. I was mending a few pieces and couldn't help but think how handy those mice in Cinderella would be about now. In light of my toilsome buttons and tares, I enjoyed the above thought. 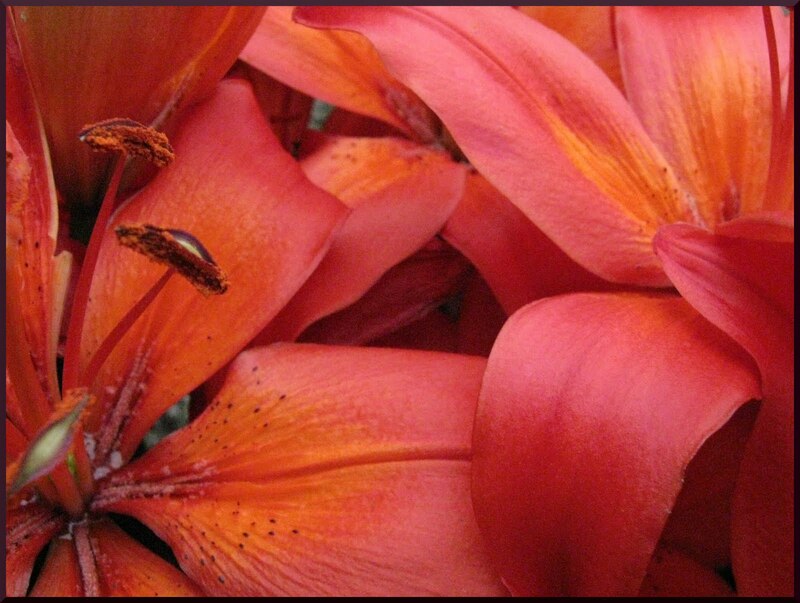 The picture is borrowed from my sister's photography. How refreshing the lilies are! Representative of a sun bursting forth, a large irregular sunburst decorates the top. Somehow, to me, the design of this parasol reminds me of ancient Grecian artwork. I have been working on a few projects , this is one project. Instead of my usual lace & ribbon,this is made with paint, sequins, plastic decals, and glue. This parasol was a bit of an experiment for me, working with an entirely new technique--paint. The spindle is painted gold, a little golden sun flower accents the top. just enough golden ribbon to form some foliage. Small golden flowers accent each spoke along the edge. There were a couple times when I applied too much paint and it chipped when dry, I had to re-paint a couple areas. The color of these pictures is a little dark, not true to reality. 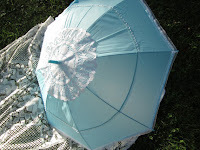 Below is a overview of the parasol folded and a true-to-life color picture.